Lutz, Florida is an unincorporated community in northern Hillsborough County about 15 miles north of Tampa. It's named after W. P. Lutz who was credited with bringing the railroad to the town about 100 years ago. Today, Lutz is bustling suburban community of about 20,000 people living in its 27 square miles. About 10% of its area is covered by water - dozens of small lakes and ponds, providing a natural, wetlands setting for many homeowners. If you are searching for a Lutz swimming pool builder to design and build a beautiful Lutz outdoor living are for you, your family and friends to enjoy, consider Grand Vista Pools. We have been building new swimming pools in Lutz, Florida and the surrounding area for more than 2 decades, and we would love to help you design and build your pool. One added benefit of hiring Grand Vista Pools is that in addition to being an experienced, Lutz pool contractor, we are a licensed general contractor. Because of this, we can design and build your entire Lutz outdoor living space as well as make renovations to your home, so that your indoor and outdoor living spaces work together beautifully. Lutz was founded in the early 1900s and has grown steadily since then. Therefore, it has some well-established neighborhoods with older homes whose pools may be in need of resurfacing or remodeling. If this describes your Lutz pool, or if you want to renovate your pool to better fit your family's lifestyle, Grand Vista Pools do this as well. Want to add a spa? How about some special lighting, water or fire features? We can build whatever you have in mind. 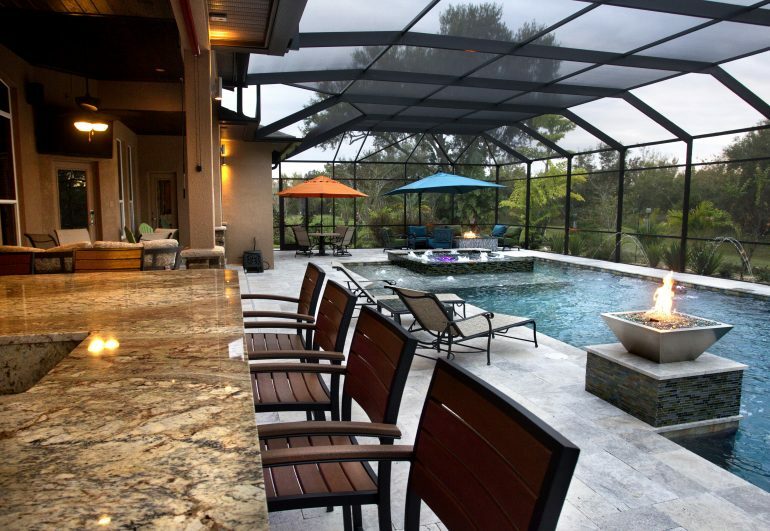 Grand Vista Pools is also a leading designer and builder of Lutz outdoor kitchens. Want to add a fantastic, full-featured kitchen? Or perhaps a manly outdoor grill is more your style? Maybe a fun outdoor bar with big-screen TV for parties with family and friends. Whatever you dream outdoor living space looks like, we can design and build it for you.